Back to School ! 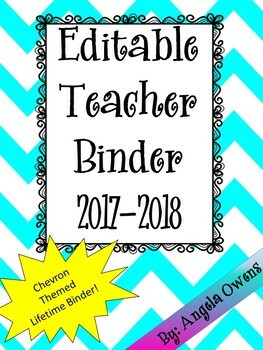 Editable Teacher Binder! This binder contains everything you need for a successfully organized year! **With this purchase you will receive updates each year. Just go to your purchases in your tpt account and redownload! **This binder is also editable, so you can add anything else you might need! **Great for back to school! Blank cover/dividers for anything else you might need! **Check out the preview to see how everything looks!